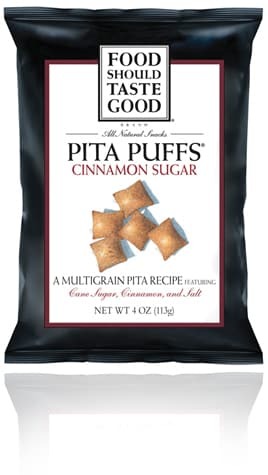 When you’ve got the munchies, these new Pita Puffs from Food Should Taste Good are the way to go! They are little, puffed out pita bites that are crisp, airy, and absolutely delicious. They come in 4 different flavors too: Chives, Multigrain, Pesto and Cinnamon Sugar. I tried them all and thought the Cinnamon Sugar was the best, though the Pesto was a close second! I bought a couple bags of the cinnamon sugar flavor and have been munching on these in the evening after dinner when I start to have cravings for sweets. And these actually help me satisfy two cravings in one, making it the perfect sweet and salty crunchy snack. I’ve been a fan of Food Should Taste Good’s products for a while now – in fact, I’ve yet to taste anything bad from them. So when I came across these new Pita Puffs at my local Whole Foods, I was pretty excited to give them a try. All natural snack foods that are kid friendly, Non-GMO, low in Weight Watchers Points, and insanely tasty make me one really happy gal. Definitely grab yourself a bag of these! They are available in health food stores and many national grocery store chains. You’d probably love Aldi’s cinna-swirl mini rice cakes too, 90 cals a bag and they are very delicious – like miniature churros! Ooooo, I’ve haven’t seen these before. Although, they may be dangerous the have around the house. Looks like something that I might eat a whole bag of!